So I was doing research online the other night and look at what I found! 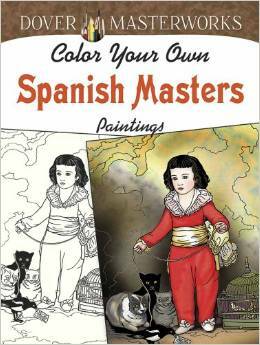 Dover Masterworks: Color Your Own Spanish Masters Paintings (aff link) is a collection of line drawings that reproduce some of the paintings of Spain's most famous artists: de Goya, Dalí, Velázquez, Borrassa, Miró, Gris, and others. Wouldn't this be a great resource for artist studies? The full-color originals are displayed on the inside covers so your child can reference them. Then he or she can color in the black-and-white illustrations on his/her own. Each one is printed on only one side of perforated paper so you can tear the completed page out and frame or otherwise display it! 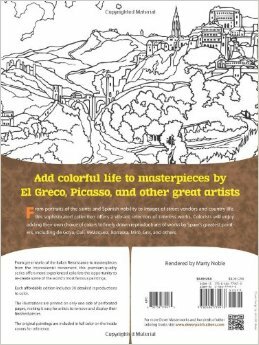 I think this would be an awesome way to supplement a unit study on: Art, Spanish painters, art history, Spain, and more. You can even use it with several students and have an art show afterward to discuss the various artists. It is best suited for children in 3rd grade and higher, or 8 years old and older.